Gardeners love their trumpet vine plants – and they are not alone. Insects love trumpet vines too and not just for the bright and attractive flowers they offer. Like with other ornamentals, expect to see insects on trumpet vines, sometimes in numbers that cannot be ignored. If you take steps to offer your plant proper care, however, you can avoid many bug problems. Read on for more information on bugs on trumpet vines and trumpet vine pest care. Trumpet vines are tough, hardy plants that thrive in U.S. Department of Agriculture plant hardiness zones 4 through 10. They don’t require much hands-on maintenance, but they do need enough water, especially when they grow in direct sun. If you let your plant’s soil get dry and dusty, trumpet vine pests are attracted. The bugs on trumpet vines can include spider mites, scale insects and whiteflies. Keep these trumpet vine insects off your plants by irrigating enough so that the soil remains constantly moist. Water nearby beds as well to keep the dust down. Mulch can help with this. Insects on trumpet vine – like mealybugs – not only damage the plant but also can attract ants. It works like this: these trumpet vine insects secrete a sweet substance known as honeydew. Ants love honeydew so much that they protect honeydew-producing bugs on trumpet vines from predators. First, get rid of the trumpet vine pests by blasting them off the plant with the garden hose. Do this in the morning on a sunny day so that the leaves can dry out before nightfall. Alternatively, if the infestation is truly out of control, use a pesticide. Neem oil is a good organic type. Then, set bait stations for ants at the base of the vine. These stations come prefilled with a poison that the ants take back to the colony. Sometimes, trumpet vine pest care includes wiping down the leaves or cutting off infected parts of the plant. For example, if scale infests your trumpet vine, you’ll see small bumps on the foliage. These trumpet vine insects are the size and shape of split peas: oval, flattish, and green-brown. 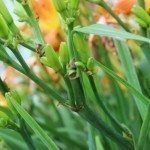 If you see clusters of scales on foliage, you can scape them off with a cotton swab soaked in rubbing alcohol or spray them with insecticidal soap. In severe cases, it is sometimes easier simply to prune out the infected areas of the plant.